A Christmas gift that will leave them wanting more. 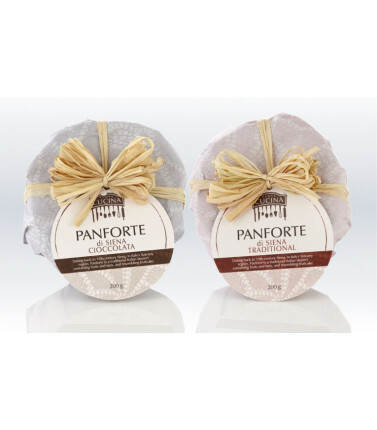 Celebrate Christmas the Italian way with this traditional panforte, a recipe containing fruits and nuts, like a fruitcake.This is a pack of 2 - Panforte Siena di Cioccolata and Panforte di Siena Traditional. A great Christmas gift to enjoy. A Christmas gift that will leave them wanting more. Celebrate Christmas the Italian way with this traditional panforte, a recipe containing fruits and nuts, like a fruitcake. There are many versions of the original panforte recipe, each a jealously guarded secret recipe of sugar dissolved in honey and all sorts of nuts, fruits and spices, mixed with flour and baked in a shallow pan, and when ready, dusted with yummy icing sugar. Enjoy a small piece of panforte at a time with your coffee at breakfast or a dessert wine after Christmas dinner. This is a pack of 2 - Panforte Siena di Cioccolata and Panforte di Siena Traditional. A great Christmas gift to enjoy. Great as corporate gifts to say thank you to staff at the Christmas party.